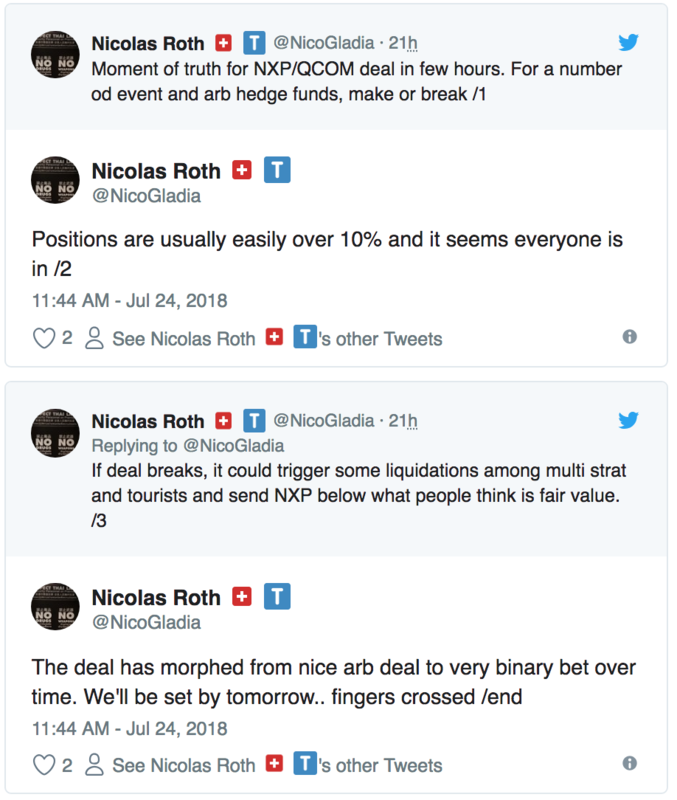 A "world of pain", as one sellside analyst put it, awaits countless M&A arbs who had piled into the $44 billion Qualcomm-NXP deal if the transaction does not get China's approval by today's deadline. And while a final decision is pending, things are now looking bleak for billions in arbed positions. According to Reuters, a source said that Qualcomm is unlikely to get Chinese approval for its NXP Semiconductors purchase by today’s deadline and is making preparations to pay NXPI the $2 BN termination fee although another source said that deal was still a toss-up whether deal could be approved at last minute. However, even the "optimistic" source said that QCOM was coming up against a "stone wall" in dealing with China’s antitrust regulator and there has been no recent progress with the regulator on the deal. China’s foreign ministry, responding to a question, said on Wednesday that relevant departments were reviewing the deal and had maintained “good communication” with Qualcomm through the review process. “Qualcomm’s takeover deal with NXP will have a far reaching effect on the global semiconductor industry,” Chinese foreign ministry spokesman Geng Shuang said at a regular news briefing. Following the news, NXP quickly tumbled as much as 6.5% to $94.15, more than $30 away from the QCOM offer of $127.50, although shares have since recovered some of their losses. And, as a list of NXP's top holders shows, roughly half of the names are some of the most prominent hedge funds who tried their hand at what initially seemed to be another "easy" M&A arb, and is about to turn out into a nightmare. Hopes for the deal rose in May after the White House said it reached a deal to lift a supplier ban on Chinese telecoms equipment maker ZTE Corp; China's approval of the deal was expected to be Beijing's olive branch to Trump in response, but now that assumption appears to be in jeopardy. A failed deal will not only leave Qualcomm on the hook for a $2 billion breakup fee, but force it to find new ways to expand beyond chips for the mobile phone market, where growth has slowed. And while a collapse of this closely-watched deal would mean more than just billions in losses for hedge funds (who may be forced to liquidate other holdings as a result), there would be far greater consequences. If the Qualcomm deal falls through it could be considered a serious escalation of the trade war by the White House and would damage China’s image as an antitrust regulator. "It would not be good for China. It will show how obviously distorted its antitrust regime is," a Reuters source said. It is worth noting that from a simple M&A arb, the deal became a binary bet on how far US-China trade wars would escalate, and as a result Trump played an outsized role in Qualcomm’s fate. In March, he issued an order blocking Broadcom Inc’s $117 billion hostile takeover bid for Qualcomm on concerns that the deal would weaken its position in so-called 5G mobile technology, allowing China’s Huawei Technologies Ltd to become the dominant player. Shortly after that, Trump began the process of imposing tariffs on $50 billion in Chinese goods. So far, he has imposed tariffs on $34 billion of these and threatened to levy tariffs on over $500 billion of Chinese exports. China retaliated with tariffs on $34 billion worth of U.S. goods. Since China imports far less from the United States than vice versa, there are fears that China would find alternative ways to strike back – including blocking deals by U.S. companies such as this one. This entry was posted on Wednesday, July 25th, 2018 at 8:11 am and is filed under Immediately available to public, Phil's Favorites. You can leave a response, or trackback from your own site.